Hey guys just started working on my 62 comet. The little 1bbl autolite that was on it was thrashed. A friend of mine had one he gave to me, difference is it's a manual choke which is okay here in Ca. Barely need the choke anyways. Only hiccup I ran into is it looks like the accelerator linkage is different. 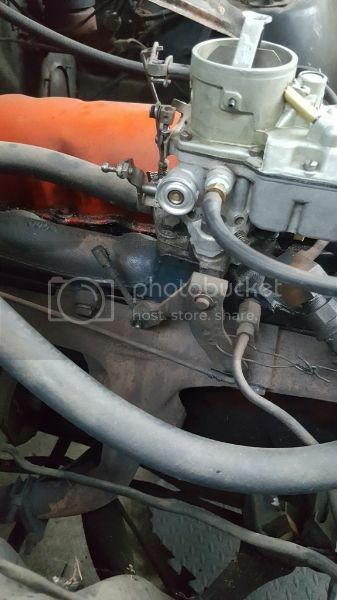 Is there a different linkage I can put on where it all connects to the spacer under the carb or is the solution to just get a longer rod for between the carb linkage and accelerator linkage. Any help is appreciated. I've attached a picture to help show what I'm talking about. I switched between Holleys and Autolites and didn't have to change the linkage, will the long horizontal rod not adjust short enough on the end to pull the arm up higher? lavron wrote: I switched between Holleys and Autolites and didn't have to change the linkage, will the long horizontal rod not adjust short enough on the end to pull the arm up higher? I don't see any kind of an adjustment on the long horizontal rod. If that rod was shorter it could swing that bracket up and make it work. Not as familiar with linkages on 6 cyl carbs but maybe this will help. It is listed for a 170/200 but also fits on v8 carb linkages. H8D-62 wrote: I don't see any kind of an adjustment on the long horizontal rod. If that rod was shorter it could swing that bracket up and make it work. Can't you just cut it in the center & weld in a new piece of rod to make it longer?